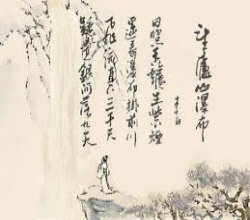 “Springing Fountains” is one of the important traditional repertoire Lingnan Qin faction. Like many guqin melodies that express motifs from nature, this one is supposed to evoke the mood of a gentle brook cascading over rocks. The first part begins with a sliding note followed by a discordant dyad. The second part begins the first of three variations on a theme, each with increasing complexity and length. Between the second and last variations, the interlude of slides and hammer-ons suggest the playful flow of water.